The ‘Goliath House’ (Goliathhaus), built in 1260, is considered one of the most well-known landmarks of Regensburg with its painting of David and Goliath done in 1573. Along with the Haus Heuport, this is the largest ‘city castle’ with in the inner city and is located on the southern base of the old roman fort. The name is likely not derived from the biblical epic, but rather from the name ‘Goliards’. Theology students were called Goliards as their guardian angel was called Golias. It is believed that the present Goliath house was built on the location of the quarters in which these traveling theology students often stayed during the 12th century. This current house would over time belong to many patrician families such as: Dollingers, Mallers and the Nuremberger family. Free Download - get it now! The Regensburg Tourist Guide explains compactly and clear the most important places of interest of our beautiful town. With it you find all information about our medieval jewel at hand. But because sightseeing is not everything, we also introduce you to an exclusive choice of high-quality bars, shops, hotels and spare time activities. You receive the Regensburg Tourist Guide free of charge at the tourist information at the City Hall Square as well as at many hotels, shops and museums. Moreover you have the possibility to download it here for free and print it. Are you looking for a hotel in Regensburg but it should be something special? Are you already planning a dinner at the romantic Old Town, not anywhere, but at one of the best restaurants in town? Do you want to have an exclusive pre-selection of shops in Regensburg and don't want to waste time with looking for them? 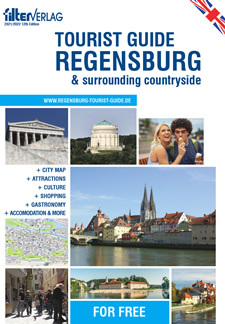 Our Regensburg Guide is the ideal manual for your perfect stay. You will need Adobe Acrobat Reader to read and print these documents. Click here to download this free program.